In this bold recasting of operatic history, Gary Tomlinson connects opera to shifting visions of metaphysics and selfhood across the last four hundred years. The operatic voice, he maintains, has always acted to open invisible, supersensible realms to the perceptions of its listeners. In doing so, it has articulated changing relations between the self and metaphysics. Tomlinson examines these relations as they have been described by philosophers from Ficino through Descartes, Kant, and Nietzsche, to Adorno, all of whom worked to define the subjects place in both material and metaphysical realms. 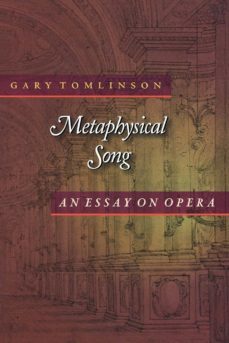 The author then shows how opera, in its own cultural arena, distinct from philosophy, has repeatedly brought to the stage these changing relations of the subject to the particular metaphysics it presumes.Covering composers from Jacopo Peri to Wagner, from Lully to Verdi, and from Mozart to Britten, Metaphysical Song details interactions of song, words, drama, and sounds used by creators of opera to fill in the outlines of the subjectivities they envisioned. The book offers deep-seated explanations for operas enduring fascination in European elite culture and suggests some of the profound difficulties that have unsettled this fascination since the time of Wagner.